Haylee Thompson celebrated a pair of Great Basin Conference tournament championships while playing girls’ basketball for Hailey’s Wood River High School in 2011 and 2012. It took only five collegiate games for the 6-1 freshman forward to celebrate a tournament championship with the Utah State University women’s basketball team last week. On Wednesday, the Aggies of first-year coach Jerry Finkbeiner won the Carrs/Safeway Great Alaska Shootout tourney with a 67-57 victory over the host University of Alaska-Anchorage Seawolves, at Sullivan Arena in Anchorage. It was the first-ever tournament title for Utah State, now in its 25th season of women’s basketball. The pre-season No. 1 in the Western Athletic Conference (WAC), Utah State (2-3) also defeated Prairie View A&M 67-66 last Tuesday. Thompson, 18, Wood River’s top scorer (15.0 ppg) and an Idaho All-State player last winter, played 14 minutes with 3 rebounds, 1 blocked shot and 1 steal in the hard-fought semi-final win over Prairie View. She played six minutes with 2 rebounds in Wednesday’s title game triumph. Utah State’s hero in Alaska was 5-7 senior guard Devyn Christensen, a native of Caldwell who earned the Idaho 5A Player of the Year honor in 2008 while playing for Vallivue High School. Christensen was voted the Shootout’s Most Outstanding Player and also earned the WAC Women’s Basketball Player of the Week honors for her two-game performance of 28.0 ppg, 6.0 assists, 5.0 rebounds and 4.0 steals. 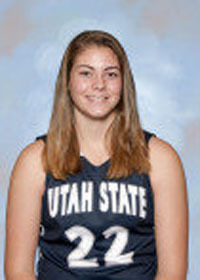 Her sixth 3-pointer of the game with eight seconds remaining gave Utah State its 67-66 win over Prairie View A&M. She also went over 1,000 career points in that game. Then, in the title game, Christensen (1,033 career points) scored a career-high 32 points for the champions. Thompson and Christensen are the two active Idaho players on the 11-player Utah State roster for 2012-13. A third Idaho player, 6-0 junior forward Kali Roche from Parma High School, is ineligible this season after transferring from Utah Valley. Roche was a state girls’ singles tennis champion for Parma in addition to being an All-State basketball star. Utah State traveled for its first six games of the 29-game season including Tuesday’s game against the University of Utah in Salt Lake City. The Aggies debut at home in Logan Saturday, Dec. 1 at 2 p.m. against Montana State. Next season, Utah State will join the Mountain West Conference. Thompson, averaging just under 3.0 points and 3.0 rebounds a game for Utah State, is the fourth-leading scorer in Wolverine annals with 780 points (10.7 ppg) in 73 games.